…read the article, and watch the videos. This is a really useful article and set of videos if you plan on working in Canada. Here are the discussion questions! Do you agree that these interview questions are inappropriate? Why? Are they appropriate or common in your experience? Do you think the gender/sexual orientation/age are important when considering a new candidate (potential employee)? 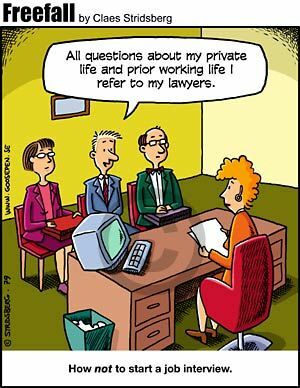 Have you ever been asked a strange interview question? If not, what is the strangest one, in your opinion, referred to on the webpage? What do you think is more important, keeping some privacy and sticking to you morals (making yourself happy), or getting a job?